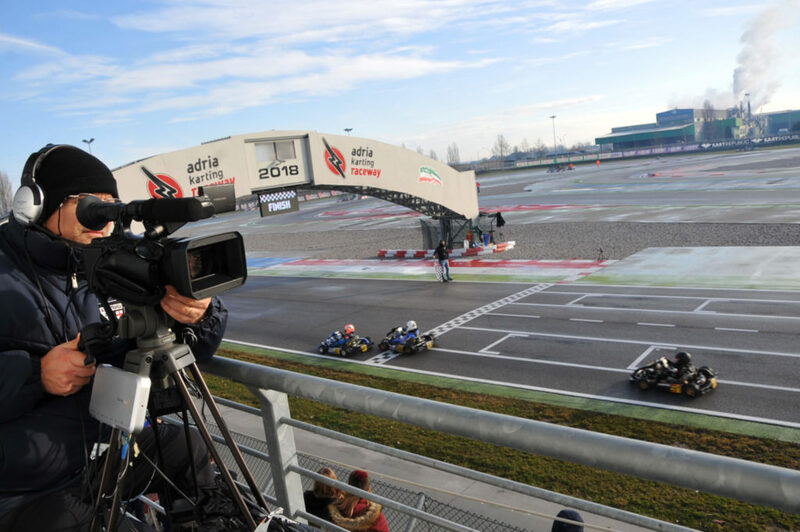 After weeks of patience and preparation, the World Series of Karting (WSK) has officially kicked off this Friday at the Adria International Raceway in Northern Italy. 168 drivers answered the call to take part in the first of the 12 events to constitute the 2019 season promoted by WSK Promotion from January to November. One week after warming themselves up at the traditional Winter Collective Tests, some of the best current karting teams and drivers took to the Adria International Raceway again (click here for the track layout) to kick things off on a more serious note, a couple of weeks after the same venue had hosted the conclusion of the WSK 2018 season with the Final Cup. If Thursday was all about Free Practice, this Friday has marked the official start of the competition with the Qualifying series and the first round of Qualifying Heats. 166 drivers are split into three categories for this event: 60 Mini, which adopts for the first time a unique silencer to achieve better control, OK Junior and OK, as the KZ2 will only appear at the second round of the WSK Super Master Series at South Garda, from February 22nd. Tires are provided by Vega (60 Mini, OK Junior) and Bridgestone (OK) with the four usual engine manufacturers: TM, IAME, LKE and Vortex along with the presence of Modena, in Junior for Jakib Bergmeister (Praga / RS Schumacher Racing Team), and OK for Pietro Delli Guanti (DR SRL). Fuel is provisioned to all categories by Panda. Due to a large number of entries (81), three Qualifying series were required in the 60 Mini class to establish the starting grid for each of the six groups ahead of the Qualifying Heats. Thanks to an improving track in the third and last series, Polish driver Maksim Orlov (Parolin-TM) was able to sign the overall Pole in 55”103 to start up front in the Group A. Fastest in series n°2, Rashid Al Dhaheri (Parolin-TM) took Pole in the Group B, as Coskun Irfan (Parolin-TM), on top in Series n°1 and Pole-sitter in the Group C. Douwe Dedecker (Parolin-TM) inherited the first spot in the Group D as well as Dmitriy Matveev (Energy Corse-TM) for Group E and Francesco Amendola (Birel-TM) in Group F.
The first eight laps on the day (A-B) were won by Jamaica’s Alex Powell (Energy Corse-TM), winner of last year’s Final Cup, one full second in front of Rashid Al Dhaheri and Joel Bergström (Parolin-TM). Ean Eyckmans (Parolin-TM) crossed the line in fourth ahead of the Pole-sitter Maksim Orlov. In the C-D race that followed, Coskun Irfan made good use of his Pole Position to finish in front of Matteo De Palo (Parolin/TM). Riccardo Paniccia (Evo Kart-TM) took the third spot ahead of Douwe Dedecker and German Foteev (Energy Corse-TM). The first Heat opposing groups E and F smiled upon the Pole-sitter Dmitriy Matveev with Lukas Malek (Parolin-TM) arriving in second place, Tom Braeken (Parolin-TM) third followed by Sebastiano Pavan (Parolin-TM) and Francesco Amendola who lost some ground after starting on the front row. Andrea Kimi Antonelli (KR-IAME), starting his first complete season wearing the Rosberg Academy colors on his suit, was the first to put int a reference lap (50″098) in series n°1 of the Juniors, before James Wharton (FA-Vortex) clinched the overall Pole position in the following series (49”993). Antonelli will nevertheless start ahead of Group B, imitated by American driver Ugo Ugochukwu (FA Kart-Vortex) in Group C, Marcus Amand (KR-Parilla) for Group D and Arvid Lindblad (Exprit-TM) in Group E.
Heading to the racing, the C-E Qualifying Heat saw Alex Dunne (Exprit-TM) winning from fourth on the grid, ahead of Laurens Van Hoepen (FA Kart-Vortex) and Martin Stenshorne (Parolin-TM). Arvid Lindblad ended up in fourth with Robert De Haan (Energy Corse-TM) in fifth. The B-D confrontation went to Andrea Kimi Antonelli from Pole ahead of Thomas Ten Brinke (FA Kart-Vortex), Ariel Elkin (Formula K-IAME), Marcus Amand and Brando Badoer (Parolin-TM). In OK, Taylor Barnard (KR-IAME) set the fastest lap of the class, putting a 48”735 around the 1302 meters of the Adria circuit, a mere 0.027 seconds ahead of his countryman Dexter Patterson (KR-IAME). Third-fastest, Dilano Van’t Hoff (Exprit-TM) got in front of Lorenzo Travisanutto (KR-IAME), all four contained in less than a tenth of a second. Last’ year’s WSK Super Master Series Junior winner Gabriele Mini (Parolin-TM) couldn’t do better than the 26th lap time after only completing two laps within the ten minutes that lasted the Qualifying session. Barnard was then able to keep his momentum going in the first of the three Qualifying Heats the Seniors will get through until Saturday night. Travisanutto got past to clinch second place in front of Danny Carenini (CRG-IAME). Only ninth after Qualifying, Harry Thompson (FA Kart-Vortex) made his effort to fourth place, followed by Cristian Comanducci (Tony Kart-IAME), another deserving result after starting P15 on the grid, and Patterson. Among other changes for the remaining of the weekend, OK Junior and 60 Mini will both benefit from an extra-Final B race on Sunday. A decision of WSK Promotion due to the very high number of drivers in these two classes but also to give one more track time to the drivers who would not qualify for the Finals. The program continues this Saturday with the first warm-up sessions starting at 9:00 and the next rounds of Heats from 10:30. Click here to follow the event with the official Live Timing provided by Apex Timing. Live Streaming by WSK Promotion will be available on Sunday. Reports will also be published every day on this website. Find below the complete schedule of the 2019 WSK Champions Cup on the Adria International Raceway.